Turkish-Australian Community across Australia have been celebrating Turkish Republic National Days in addition to our Australian National Days. 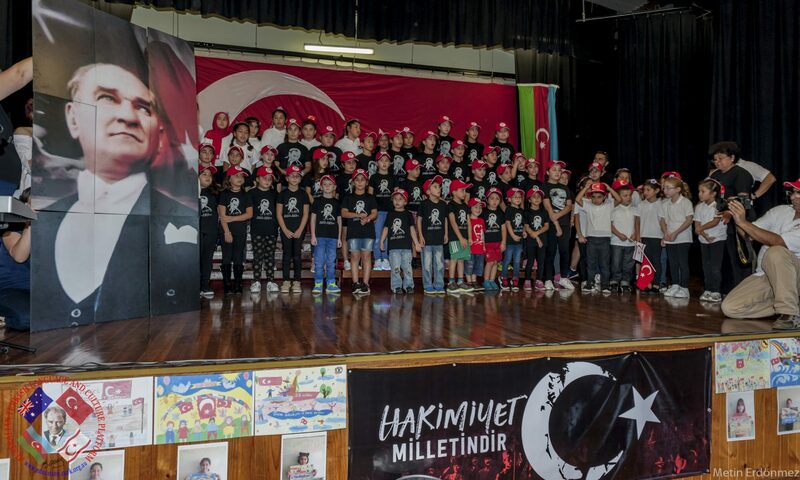 A number of non-profit community organisation of which some of them operate Turkish language community schools have joined forces to celebrate especially two very important Turkish Republic National Days in Australia. 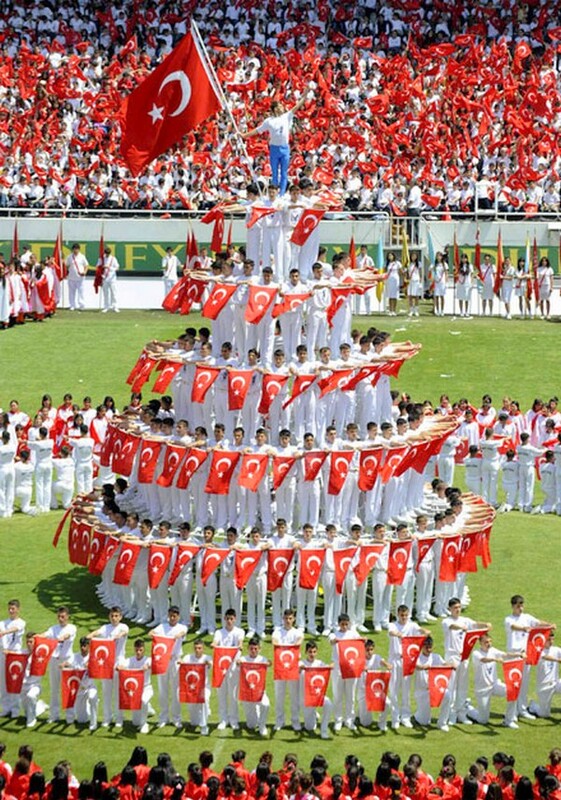 This national day (23 April National Sovereignty and Children’s Day) in Turkey is a unique event. 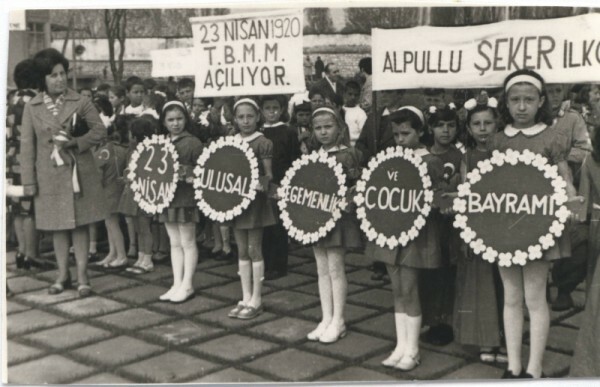 The founder of the Turkish Republic, Mustafa Kemal Atatürk, dedicated April 23 to the children of the country to emphasize that they are the future of the new nation. It was on April 23, 1920, during the War of Independence, that the Grand National Assembly met in Ankara and laid down the foundations of a new, independent, secular, and modern republic from the ashes of the Ottoman Empire. Following the defeat of the Allied invasion forces on September 9, 1922 and the signing of the Treaty of Lausanne on July 24, 1923, Ataturk started his task of establishing the institutions of the new state. Over the next eight years, Ataturk and his followers adopted sweeping reforms to create a modern Turkey, divorced from her Ottoman past. In unprecedented moves, he dedicated the sovereignty day to the children and entrusted in the hands of the youth the protection of this sovereignty and independence. 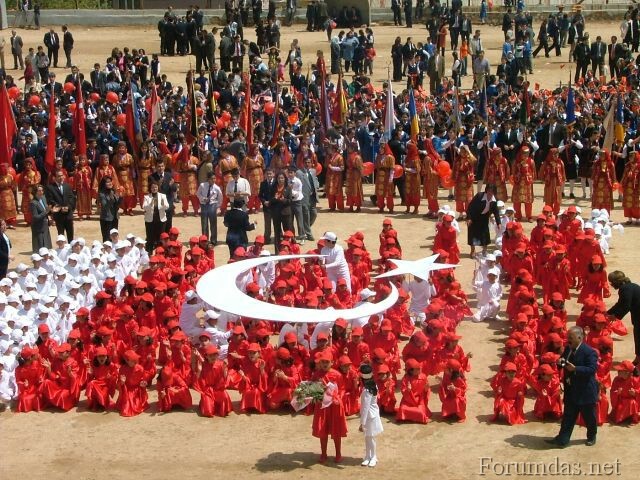 Every year, the children in Turkey celebrate this “Sovereignty and Children’s Day” as a national holiday. Schools participate in week-long ceremonies marked by performances in all fields in large stadiums watched by the entire nation. Among the activities on this day, the children send their representatives to replace state officials and high ranking bureaucrats in their offices. The President, the Prime Minister, the Cabinet Ministers, provincial governors all turn over their positions to children’s representatives. These children, in turn, sign executive orders relating to educational and environmental policies. On this day, the children also replace the parliamentarians in the Grand National Assembly and hold a special session to discuss matters concerning children’s issues. Over the last two decades, the Turkish officials have been working hard to internationalize this important day. 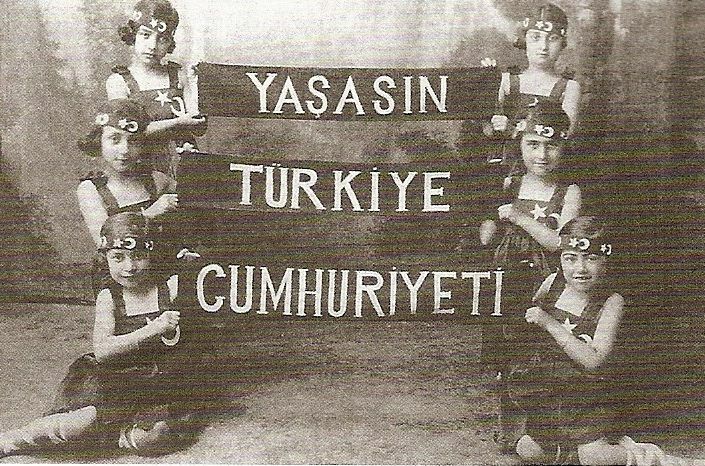 Their efforts resulted in large number of world states’ sending groups of children to Turkey to participate in the above stated festivities. During their stay in Turkey, the foreign children are housed in Turkish homes and find an important opportunity to interact with the Turkish kids and learn about each other’s countries and cultures. 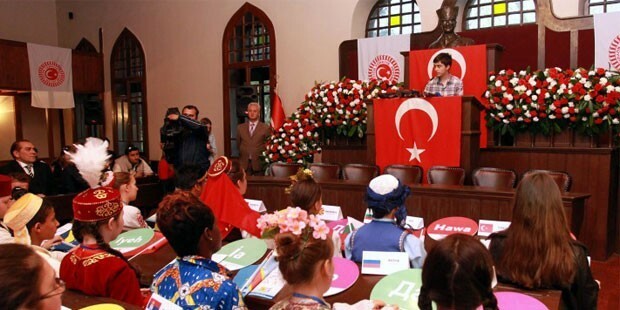 The foreign children groups also participate in the special session of the Grand National Assembly. This results in a truly international Assembly where children pledge their commitment to international peace and brotherhood. The importance of April 23 as a special day of children has been recognized by the international community. UNICEF decided to recognize this important day as the International Children’s Day. 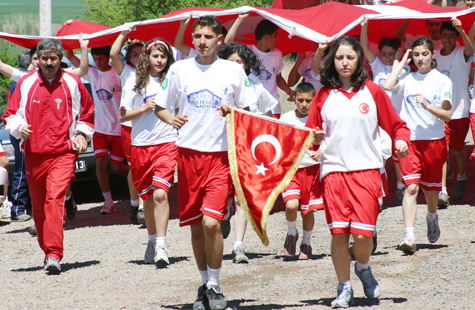 The 19th of May every year marks Youth and Sports Day Turkey (Gençlik ve Spor Bayramı) which was started by Mustafa Kemal Atatürk. After the death of Mustafa Kemal Atatürk it was decided that the day would also be the day to Commemorate Atatürk. 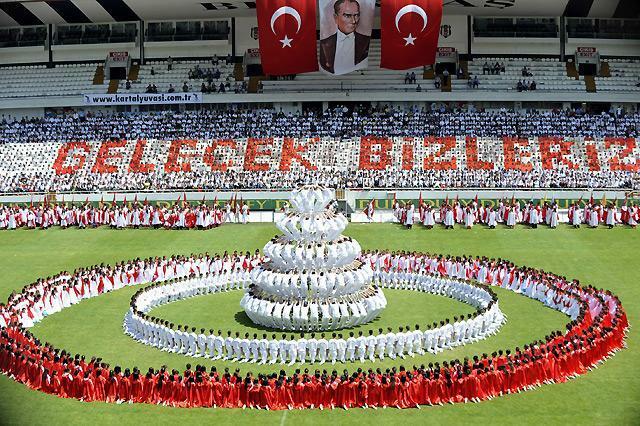 Changing the day to Commemorating Atatürk, Youth and Sports Day (Atatürk’ü Anma, Gençlik ve Spor Bayramı). One of the main traditions of this day is young Turkish athletes run with the Turkish flag from the Black Sea Port at Samsun where Atatürk began the War of Independence and over 10 days the flag is carried across the country to Turkey’s Capital Ankara finishing with the flag being handed to Turkey’s current President who accepts the flag during a ceremony on the 19th of May. A Minutes silence is also observed in memory of Atatürk and wreaths and flowers are laid at monuments of Atatürk throughout country including at the Anitkabir the mausoleum of Mustafa Kemal Atatürk. Various sports events take place during the day which are watched by many at the local stadiums and there are also many parades and ceremonies throughout the day. For those who are living in Turkey this is also a national holiday which means banks and official offices will be closed on the 19th of May. It’s a great day for families and children and you can get involved by going along to your local stadium and enjoying the day’s activities. 29 of October 1923, Turkish parliament proclaimed the establishment of the Republic of Turkey, formally marking the end of the Ottoman Empire. On the same day, Mustafa Kemal, who led the Turkish National War of Liberation and was later named Atatürk (father of Turks), was unanimously elected as the first president of the Republic. The Turkish War of Independence, started on the 19th May 1999 by Mustafa Kemal landing in Samsun and ended 3 years later driving out the occupying allied forces of World War 1 from the mother land of Turkish people. 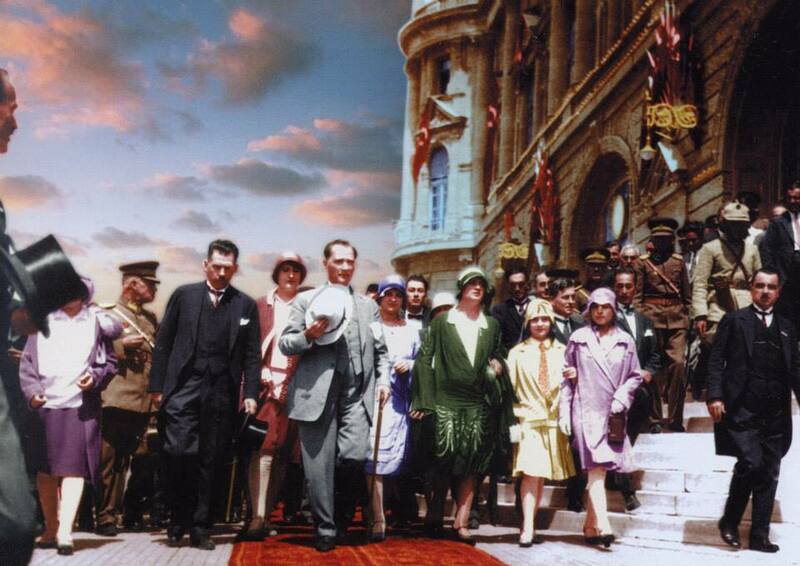 Turkiye had effectively been a republic from April 23, 1920 when the Grand National Assembly was inaugurated in Ankara. When the Turkish parliament held its first session in 1920, virtually every corner of the crumbling Ottoman Empire was under the occupation of Allied powers. Exasperated by the Ottoman government’s inability to fight the occupation, the nationwide resistance movement gained momentum. With the Allied occupation of Istanbul, and the dissolution of the Ottoman Parliament, Mustafa Kemal’s justification for opening the resistance movement’s new legislative body was created. With the opening of the Assembly, Ankara became the center of the Turkish national struggle for liberation. The National War of Liberation culminated in the emancipation of Anatolia from foreign occupation, the international recognition of modern Turkey’s borders by the Treaty of Lausanne, and finally, the founding of the Republic of Turkey on October 29, 1923. October 29- or Republic Day- is an official Turkish holiday celebrated each year across Turkey and by peoples of Turkish heritage world over. Schools celebrate this day with presentations, sing songs, displays and readings. All official government offices and schools are closed and there are many celebrations throughout the country. There are also official celebrations in the capital city of Ankara including a ceremony at the Anıtkabir, Atatürks Mausoleum. You will also see the Turkish flag everywhere and flags and banners depicting Atatürk. Turkish Language and Culture Platform merged the efforts of both aformentioned Turkish National Days for 2014 and mutually agreed to carry out a big celebration day as a Children and Youth Festival in 2014. All Australian communities are welcome to join and celebrate the achievements of our children and youth while providing formal recognition to their place in multicultural social contruct of our great country Australia.